Fresh from the ice to a spot on your table, this authentic blade toasts your favorite team. Fresh from the ice to a spot on the table, this game-used blade toasts your team. 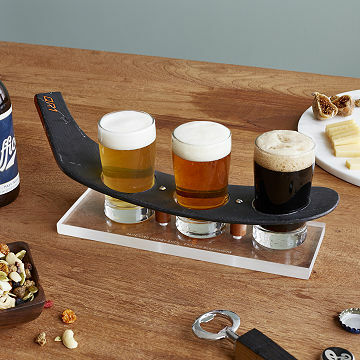 While you're sampling beer (or whiskey) with fellow fans, take a good look: The carbon fiber stick and rink glass base both have real "battle scars" from games, and your team's name is engraved on the glass. Officially licensed by the NHL, each includes a holographic label and ID number for authenticity as well as info about your stick's history online. Handmade in California. Wipe clean with a damp cloth. Glasses are dishwasher friendly.